Exploring Greco-Roman mythology through art. In 1498, Albrecht Dürer carved a series of fifteen woodcuts and titled the series Apocalypse. 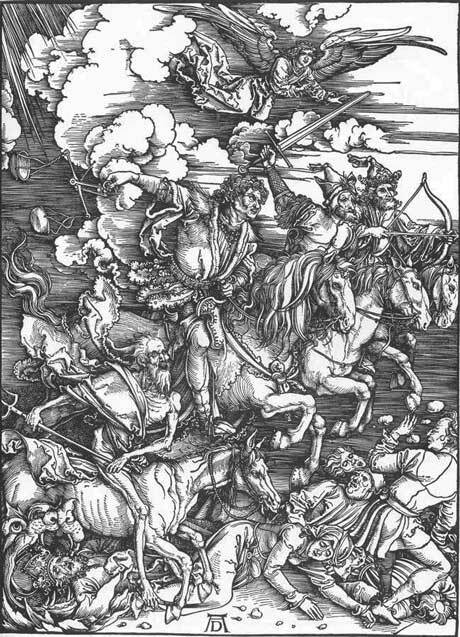 Of the fifteen woodcuts, however, the third, The Four Horsemen of the Apocalypse, is one that earned the most widespread European recognition for Dürer. Four Horsemen was, in regards to the particular subject content, the most refined and well-known rendition at that time. Anticipation of the apocalypse was frequently speculated in Reformation Europe between 1490 and 1648. Dürer managed to capture this somewhat Gothic mood in a single series while simultaneously revolutionizing the medium of woodcutting. Though these excerpts from Revelation aren’t exactly popular Biblical passages, Dürer was able to depict The Four Horsemen of the Apocalypse as a powerful and dramatic scene with plenty of movement. The Four Horsemen was based on a specific excerpt from Revelation chapter 6, in which John is having a vision of the seven seals being opened by the Lamb of God (Christ). With the opening of each of the first four seals, there came four sets of a horse and rider, each one representative of different events to come in the End Times tribulation. From left to right, Dürer depicted Death, Famine, War, and Plague (or Pestilence). The first passage in Revelation chapter 6 (Rev. 6:1-2) reads, “Now I watched when the Lamb opened one of the seven seals, and I heard one of the four living creatures say with a voice like thunder, ‘Come!’ And I looked, and behold, a white horse! And its rider had a bow, and a crown was given to him, and he came out conquering, and to conquer.” According to the majority of art historians’ interpretations, this first rider represents Pestilence or Plague. However, some interpret the passage differently and believe the rider could represent Conquest, as well. Dürer represents Pestilence, the furthest rider on the right, on a white horse. The white horse, according to some interpretations, could be significant of either Christ or the Anti-Christ. The basis of this interpretation comes from the passage of Revelation 19:11-16, which also predicts the coming of the Anti-Christ (a false imitator of Christ) on a white horse. The second passage of Revelation continues (Rev. 6:4) when the second seal is opened saying, “And out came another horse, bright red. Its rider was permitted to take peace from the earth, so that people should slay one another, and he was given a great sword.” This rider represents the war that will ensue as a result of the End Times. The next passage (Rev. 6:5-6) is described as such: “And I looked, and behold, a black horse! And its rider had a pair of scales in his hand. And I heard what seemed to be a voice in the midst of the four living creatures, saying, ‘A quart of wheat for a denarius, and three quarts of barley for a denarius, and do not harm the oil and wine!’” The rider from this passage represents the famine that will break out, probably as a result from the previous war. The last passage (Rev. 6:8) says: “And I looked, and behold, a pale horse! And its rider’s name was Death, and Hades followed him. And they were given authority over a fourth of the earth, to kill with sword and with famine and with pestilence and by wild beasts of the earth.” This image of Death incarnate is the most haunting, especially since it is in the foreground and attracts the viewer’s attention; both the rider and his horse are grossly malnourished and bony, thus appropriately resemble lifeless creatures. True to the passage, a monster of a creature (Hades) follows closely behind him with its mouth open wide, swallowing whole anyone who is in the way. Amy Snyder; The woman in charge.